Lyon, in the heart of south-central France, is an eclectic city: the remains of the Roman Empire are complemented by the findings of industrial archeology, the centers of high finance and banking by those of the production and processing of silk. Closed between the rivers Rhone and Saone, Lyon is a wonderful city, cultural, financial and industrial center at the foot of the French Alps. Lyon is famous worldwide for the textile industry and especially for the production of silk. The city has Roman origins, and Gallo-Roman ruins are scattered all around the whole city: on the hill of Fourvière there is a museum with objects of those remote ages. But the peculiarity of Lyons is to be successful in various styles of European architecture: Renaissance buildings are located in the district of Vieux Lyon, that in the evening is full of tourists and night owls, while in the district of Croix-Rousse, where once there was the silk industry, there are the homes of employees of the silk, the canuts, with ceilings up to 4 meters high to hold the Jacquard looms. The city has always been the center of financial assets and prestigious printing houses that made it extremely rich: during the seventeenth and eighteenth centuries, here were dressed the noble and wealthy families of around the world. 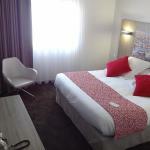 Today Lyon is a city that has a small centre and therefore easy to explore on foot: here are the most prestigious hotels, both housed in Renaissance buildings and modern hotels, but always with all the necessary amenities to make your stay pleasant for both business men and tourists visiting the city. The main attractions are included in the closed-centre between the two rivers, the Rhone and the Saone: the above mentioned Fourvière hill with the oldest part of town, the Vieux Lyon Renaissance area, the Presqu'île - the heart of downtown, the areas known as Bellecour and Primatiale, Place Bellecour with the statue of Louis XIV and XVIII century buildings with beautiful trompe-l'oeil, the church of San Martino, the Cathedral of St. John, the basilica of Notre Dame de Fourviere, Rue de la Republique and Rue des Marronniers for shopping and restaurants and countless museums. To visit the city you should use the Lyon City Card, which allows the use of public transport and access to museums and tourist attractions with remarkable discounts. 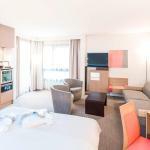 The Novotel Lyon La Part Dieu is located not far from the bustling centre of Lyon, near the business district of La Part Dieu, and the TGV station. The tram, metro and shuttle bus stops are in front of the hotel. 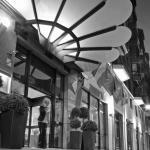 The Premiere Classe is situated in the business district of Lyon, close to the railway station Lyon Part-Dieu. The hotel provides a shuttle service to reach the airport in only 45 minutes. 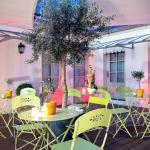 Cozy two-star residence, Les Carrés Pégase rises in the heart of the beautiful French city of Lyon, in a lively and interesting area within walking distance from the Parrache railway station and city centre.